Solar Power News & DIY Solar Tips > DIY Solar Tips > What Can I Power with a 100W Solar Panel? Ever wonder what you can power with a 100W solar panel? Over 100,000 viewers have…and now know the answer! 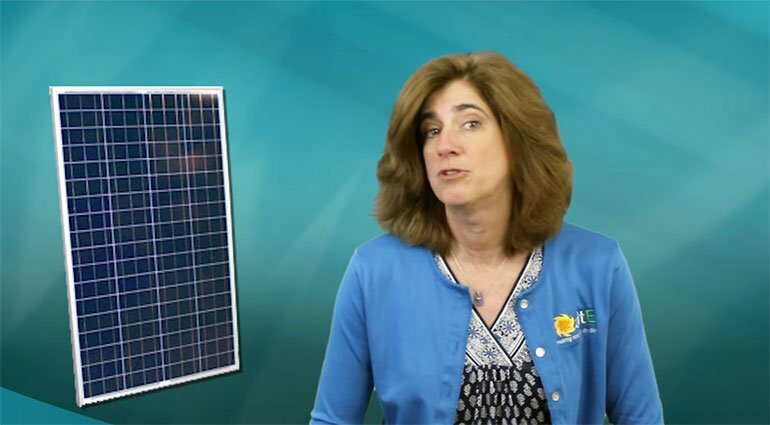 Also, be sure to subscribe to the altE YouTube channel for even more DIY solar videos. We sell a lot of solar panels for DIY off-grid solar projects. Generally, when we design a solar power system, we start with your loads, what you are trying to power, and from there you figure out what size solar panel you need. But now, we are going to look at it the other way around, what can you power with a 100W solar panel? A solar panel is rated by the amount of power it creates at Standard Test Conditions, or STC. These conditions include the intensity of the sun, 1000 watt per square meter, the angle of the light hitting the panel directly, the temperature, 25℃ or 77℉, and other criteria. So as they say, actual mileage may vary, based on all of these factors in the real world. We generally reduce the calculations based on the difference between the lab setting and your actual installation. When a 12V solar panel is rated at 100W, that is an instantaneous rating, if all of the test conditions are met, when you measure the output, the voltage will be about 18 volts and the current will be 5.55 amps. Since watts equals volts times amps, 18 volts x 5.55 amps = 100 watts. Watts is like the speed of a car, miles per hour, how fast is it going at that instant, 50 miles per hour. To figure out how much power is generated over a period of time, you can to multiply the watts times the number of hours it is running. So in one hour, 100W x 1 hour = 100 watt hours. Again, with your car, 50 miles per hour x one hour equals 50 miles. Now that we know the math behind it, we need to figure out how many hours to plug into the equation to determine how much power the solar panel will generate in a day. How many hours of sunlight that is equal to the intensity of standard test conditions, which is basically the sun at noon, will the solar panel be exposed to during the day? The number of hours of sunlight equal to noon is called insolation, or sun hours. As you well know, even though the sun is up at 8 in the morning, it is not as bright as it is at noon. So you can’t just say that the sun is shining for 10 hours, so I’ll multiple 100W x 10 hours. The hour between 8 and 9 in the morning is probably only half as strong as the sun from noon to 1 in the afternoon, so the morning hour would probably only be equal to ½ sun hour. But the days are so much shorter in the winter than the summer, the number of sun hours would be dramatically different throughout the year. Also, the amount of sunlight I’d get in MiamI, FL would be different than the amount of sun hours I’d get in Portland, ME. Luckily, some very smart people have taken decades worth of weather data and calculated out the number of sun hours for all over the world, broken out by month, and even the tilt angle that the panels are mounted. So I can look at the charts to see if I have a 100W solar panel, in Portland, ME installed at about 45 degrees angle, on annual average, I’d get 4.6 sun hours a day. Likewise, if I took that same solar panel in Miami FL, installed it at a 25 degree tilt, I’d have an annual average of 5.2 sun hours. Just as a little aside, I want to make sure you see that during the months of June and July, I’m going to get more power out of that solar panel in Maine than I will in Florida. With Miami being closer to the equator and Maine being closer to the north pole, the days are longer in the summer in Maine, and so the sun shines on the solar panels longer. Kind of cool, huh? OK, back to the question at hand, what can I power with a 100W solar panel? I need to figure out my worst case scenario, what is the worst performing month that I’ll be using the panel? Since, for this example, I’m going to be using it in Maine, during ski season, I need to figure on December. So how can I squeeze out as much power as I possibly can in December? By tilting the solar panel steeper so it points right at the low winter sun. So I’m going to mount my 100W solar panel at 60 degrees and figure on 3.2 sun hours. I’ll now take 100W x 3.2 sun hours and get 320 watt hours a day in December. Now, as you know, nothing in real life is perfect, so I have to figure in losses that I’ll likely incur, such as voltage drop across the wire, dirt (or snow) accumulating on the solar panel, losses through the charge controller, etc. So I’m going to multiply the 320 watt hours times .7. I know, that’s figuring on losing about ⅓ of your power. I now end up with 224 watt hours of power that I have made with my 100W solar panel on a December day. What can I do with that power? Well, first of all I need to store it in a battery so that I can use it later when I need it. So, I’m going to use at least a 7 amp charge controller to manage putting the power into a deep cycle battery that can be charged and discharged on a regular basis. What size battery do I need? Sorry, that calls for more math. I have my 224 watt hours that I’m making, and I’m putting it in a 12 volt battery. Because watts divided by volts equals amps, 224 watt hours divided by 12 volts equals 18.6 amp hours. Even though I’m putting it in a deep cycle battery, most batteries still don’t like being drained down more than half way, so I’m going to make sure I get a battery that can hold at least twice as much power I will be using, so I’ll only use half of the power in it. 18.6 amp hours x 2 = 37.2 amp hours. The amount of power a battery can store changes depending on the temperature of the room it’s in. If my battery is going to be as cold as 60 degrees Fahrenheit, I need to increase the size of my battery by 11% to accommodate the cooler temps. 37.2 amp hours x 1.11 = 41.3 amp hours. I’m also going to be converting the DC power from my battery to AC using an inverter, and I’m going to lose about 5% of my power through that conversion, so 41.3 amp hours / .95 = 43.4 amp hours. Now I don’t know if you’ve ever been in Maine in the winter. But trust me on this one, the sun doesn’t shine every day there in December. Not by a long shot. So I need to figure out how many days without sun that I need to store the power for to get me through those sunless days. Let’s say I need it to last me the weekend without sun. 43.4 amp hours x 2 days = 86.9 amp hours. Great, I’m going to get myself a group 27 deep cycle battery, that’s 89Ah 12V. OK, now, I can finally figure out what I can do with that power. I can run my laptop that uses 45W for 5 hours. Because 224 Watt hours / 45W = 4.97 hours. Or I can power 3 of my 10W LED lights for 7 hours, and still have a little power left over. Or I could make myself a cup of coffee, listen to the radio while reading a book with a 10W light on for 3 hours, and use my laptop for 2 hours. This should give you enough information so that you can figure out how to fit this into your situation. You can change the numbers to fit your area, and your power needs. Thank you altestore for this very informative theoretical approach to a practical solution. This post actually help share light on those sticky question installer are face with. You are very welcome, John. Glad it helped! What if in the joy of using your appliances, u drained more than 50% of the battery’s stored energy, what will be the consequences. Thank you for your question. For most battery styles, they will last longest if you only discharge them about 50%- meaning you only use approx 50% of the capacity. If you regularly drain them more than that, they’ll tend to have a shorter life span. Some styles of batteries, like Aquion, can tolerate that better. In other cases, such as battery back-up which isn’t used all the time, it doesn’t matter as much since the batteries’ are more likely to reach “old age” before the end of cycle life. We did a 2 part blog on water pumping. Take a look at them first, https://www.altestore.com/blog/2016/05/solar-water-pumps-part-1/ and https://www.altestore.com/blog/2016/05/how-to-size-solar-water-pumping-system/, and then give us a call so we can help you design the system. It’s a bit too complex to address in a blog comment. We’ll be happy to help.